It’s that time of year again, when we get to show some extra love to our independent bookstore partners! Independent Bookstore Day is this Saturday, April 28, with great literary goodies and fun activities. It’s an all-day party to celebrate the independent bookstores in our communities. Independent booksellers are some of our most important partners–they buy and promote Two Lines Press books and offer their space for our events with international author and translators. So we’re delighted to spread the word. 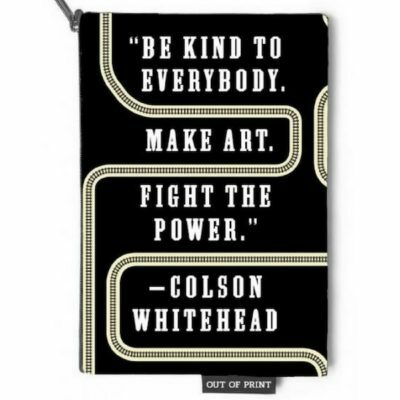 Limited edition swag includes a “Fight the Power” utility pouch inspired by The Underground Railroad author Colson Whitehead, a “Bad Citizen” graffiti stencil featuring Margaret Atwood’s timely The Handmaid’s Tale quote, “Don’t let the bastards grind you down,” and official Independent Bookstore Day totes and t-shirts — only available for purchase on April 28. Here are highlights of Bay Area events—find an indie bookstore near you on the official IBD website! Books from the future See a selection of advance reader’s copies of books that have not yet been published and read them before anyone else can. Blind date with a book A selection of our favorite books for you to buy blindly, so take a chance for a mere $7. Endless typewriter scroll Help collaborate on a story tapped out on an old dusty typewriter. 10am-noon: Big Kids / Little Kids Juice Stand (mimosas & juice)! 11am-1pm: Illustoria will be here with a special craft bookmaking time for kids of all ages. 5:30pm: Author and activist Betty Reid Soskin shares insights about her memoir, Sign My Name To Freedom, as part of Independent Bookstore Day and the Bay Area Book Festival. Highlights include bilingual storytime readings, team scavenger hunt, and local children’s book authors Maggie Tokuda-Hall and Tim McCanna. The Booksmith & The Bindery are excited to celebrate the fifth annual Independent Bookstore Day together! Featuring custom swag and sign-ups for our Book Club Rewards program for discounts on the day of and for the rest of the year. The Bindery bar will be open from 12-7 PM serving beer, wine, and craft cocktails. Spend $30 at either store and get a free drink! 3:00 pm: Georgeanne Brennan presents Windows on Provence: Musings on the Food, Wine, and Culture of the South of France. 1:00 pm: Nate Pollak & Heidi Gibson, founders and chefs at American Grilled Cheese Kitchen. They’ll bring small tastes from their cookbooks.